The summer before sixth grade, Suzanne moved to town. We could not have been any more different. I was a shy, small town girl who had traveled out of my home state one time. She was a spit fire, southern belle, Army brat who had traveled the world! Though an unlikely pair, we hit it off immediately and spent every waking moment we could together that summer. Prior to moving to small town, Missouri, Suzanne lived in Germany, and before that, Savannah, Georgia. I learned a lot from Suzanne that summer - like how to speak German with a Georgia accent, how to dance, and how to blow a bubble with bubblegum. I remember the first dance Suzanne taught me...the box step. With my 45 record of Kool & the Gang's, "Celebration" blaring in the background, over the course of one summer afternoon, she successfully taught me how to move my two left feet in an organized and rhythmic fashion. Our next dance lesson didn't go as well though. "Bust a move" and "drop it like it's hot" are words in my vocabulary, but the buck pretty much stops there. A dancer I am not. Suzanne, on the other hand, could merely shuffle her feet and look amazing. Nonetheless, despite her attempts at teaching me to moonwalk, I still resembled something of Igor dragging a foot behind. Sigh. In July 1969, astronauts Neil Armstrong and Buzz Aldrin did their own moonwalk of sorts. The astronauts were aboard Apollo 11, the first spaceflight to land humans on the moon. 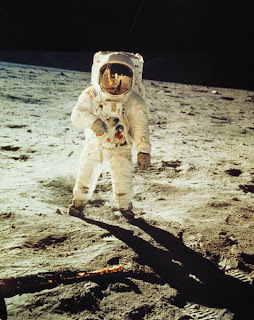 Upon landing and taking his first lunar steps, Armstrong stated the famous words, "That's one small step for man, one giant leap for mankind". Small steps, and giant leaps? Hmm, that sounds an awful lot like my walk with Christ. Maybe, just maybe, I am a moonwalker after all? More often than not, when the Lord lays something on my heart, my first reaction is to shuffle my feet, take a few steps here and there, and repeatedly ask, "Um, are You sure, Lord? I mean, do You really want me to…?" It’s typically not until I've taken a whole lot of small steps that I take the giant leap of faith. Small steps and giant leaps…yep, that's what my moonwalking faith looks like. Heavenly Father, I thank You for the opportunities You give us, despite our imperfections, to serve and glorify You. Lord, I commit this new ministry and my life to You. I pray for Your will and not my own, and I praise You and thank You for the great things You have already done, the greater things yet to come, and the greater things still to be done here….Great are You, Lord and worthy of praise! *If you feel so inclined, I would immensely appreciate your prayers for the new ministry – "Greater". The purpose of "Greater" is to foster a spirit and atmosphere within the church and within our communities that is conducive to growth – a spirit and atmosphere that is less of us and more of God. 1 John 4:4 says the One who is in us is greater than the one who is in the world. Therefore, the more filled we are with the Holy Spirit, the more His spirit, and not our own, will permeate and draw us together in unity. He is greater! Thank you for your prayers!